There’s something of a history of British films about aristocratic families stuck in their country piles and descending into insanity while their opportunistic employees look on. The yardstick, of course, was Sir Henry at Rawlinson End, a bonkers comedy written by Vivian Stanshall about the titular eccentric peer and his phantom brother, while in more recent years the standout film of the type has probably been Simon Rumley’s The Living and the Dead, a rather darker affair. Adam Levins’ Estranged follows in this tradition, having many similarities in particular to Andrew Sinclair’s Blueblood, the 1974 film in which butler Oliver Reed takes over the possessions and position of his weak-willed master Derek Jacobi. 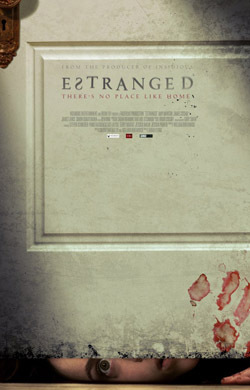 Although heavily reliant on the unlikely and the illogical, Estranged is a rather enjoyable little film, superior to most low budget British horror movies thanks to the winning performances and compact approach. Manson makes for a likable lead whose life goes rapidly down the pan as the running time progresses, Cosmo is his usual lurking presence, while Lance and Noone contribute arch, stylised performances. The characters are peculiar rather than believable and the twist is hardly surprising – or the bits of the twist that make any kind of sense, that is. None of this matters too much because the pace is maintained, the mood well-judged and the story is idiosyncratic enough to maintain the attention, even as the events depicted become increasingly grotesque and graphic. Not at all bad.